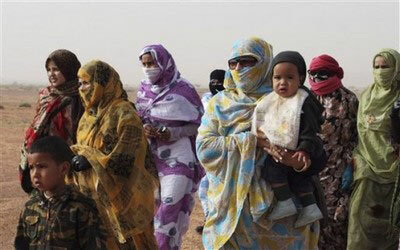 At the time when the whole world celebrates women’s international day, the desperate case of Sahrawi women living in Tindouf camps comes up with all its strength. Many evidences collected directly by the press from Sahrawi women who have by a miracle escaped from the forced sequestration in Lahmada camps, at the South-West of Algeria, tell with great regret the terrible conditions in which are surviving the Sahrawi women in this open air prison. Radio Tangiers has broadcasted on Tuesday, in its program “good morning Tangiers, overwhelming evidences from Moroccan Sahrawi women having escaped from Tindouf camps, who all of them agreed in qualifying life conditions of women in these camps as being inhuman. In their declarations, these women tell about all the aspects of torture, enslavement, and constraints which they have themselves lived and to which thousands of Sahrawi women are still submitted, in flagrant violation of human rights international conventions and charters. Amari Salka, a former survivor of Tindouf camps, has thus talked about “an everyday enslavement and traffic of human beings of which are suffering mainly women and children”. Many families, she said, were thus dismantled because of the kidnapping practised by the Polisario armed militia on the parents and children. The latter, has she specified, are often sold very young to strangers without the knowledge of their tearful parents. The humanitarian situation in Tindouf camps, adds Amari Salka, is very alarming and becoming more serious because of the misappropriation of human aids, intended for the sequestrated, by the Polisario leaders. She has even denounced the propaganda speaking about “women leaders” in Tindouf camps, in a vain attempt to hide the deplorable life conditions of sequestrated women. These same feelings of regret and reproaches were expressed by other women from the Moroccan provinces in the South, Meskoula Hassan and Ali Cheggaf, who have talked about the big difficulties faced by the sequestrated populations, qualifying the life in these camps of being “an unbearable humanitarian tragedy”. They tell also that women who try to escape from this hell, run the risk of being arrested and sold by the Polisario mercenaries. The indignation and bitterness as regard enslavement practices and atrocities still taking place in Tindouf camps, are leitmotivs for all these women.